Secret of Mana, known in Japan as Seiken Densetsu 2, is an action role-playing game developed and published by Square and the second installment in the Mana video game series. Rather than use the traditional turn-based battle system of games like Final Fantasy and Dragon Quest, Secret of Mana uses real-time battles akin to the Legend of Zelda series' games, but with the statistical-based elements of the RPG genre and a unique "ring menu" system. In addition, with its brightly colored graphics, expansive plot, and soundtrack by Hiroki Kikuta, Secret Of Mana has been called one of the greatest video games ever made. 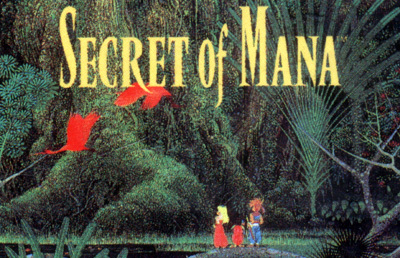 Secret of Mana was originally going to be a launch title for the SNES CD add-on. After the project was dropped, the game had to be altered to fit onto a standard cart.